At Berkey Filters, we utilize advanced and powerful filters that we call our Black Berkey filter elements. 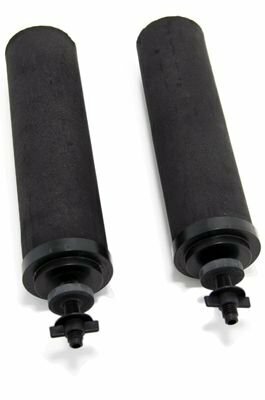 The Black Berkey filters used in all of our systems take water filtration to a new level. During testing conducted by independent, EPA-approved laboratories, the Black Berkey filtered out a long list of water contaminants with never-before-seen results and significantly raised the standard for the water filter industry. As a result, Black Berkey filters are some of the most efficient filters that are currently available on the market. When drinking water that’s been filtered using a Berkey Black filter, you can rest assured that your water is clean and safe for consumption. In fact, Black Berkey purifier elements are far more powerful compared to competitors’ water filters. We tested the filters with more than 10,000 times the concentration of harmful pathogens per liter of water than is required by industry-standard test protocols. This concentration of pathogens is so high that the water exiting the filters should be expected to contain a concentration of 100,000 or more pathogens per liter (99.99% reduction — the requirement in order to be classified for pathogenic removal). Incredibly, Berkey water filter elements removed 100% of the pathogens. After using the Black Berkey filters, absolutely no pathogens were found in the effluent or were able to be detected. This set a new standard, allowing us to classify all systems containing the Black Berkey filters as purifiers. The revolutionary Berkey purifier elements are so powerful that they can remove food coloring from water without removing any of the beneficial minerals your body needs. Black Berkey water filters are available for purchase online right here on our website. As you shop for our filters or water filter systems, you may have questions before you buy: Simply contact us with any questions by using our toll-free number. Our customer service reps are qualified professionals and can answer any of your questions regarding our Black Berkey purification elements.